Healthy Line provides the absolute best healing mats on the market today. 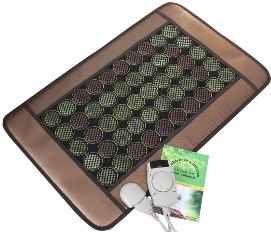 This healing mat uses a combination of the finest jade and tourmaline stones to activate energy waves in the advanced Far-Infrared (FIR) process to provide the most effective remedial process of any healing mat. The jade stones used in this InfraMat Pro healing pad are the most effective healing stones. Jade has been used for over 2,000 years throughout China to heal a wide array of ailments. Jade stones are very effective in fighting disease and sickness, including heart, kidney, and stomach illnesses. The Far-Infrared released from jade stones act as a shield against harmful electromagnet and static waves. The composition of jade allows the stones to be extremely effective in absorbing natural heat, which is essential in emitting Far-Infrared and providing the best healing properties possible. For all healing and therapeutic uses, including immunity, metabolism, and natural beauty and health care, jade is the most effective remedy available. InfraMat Pro also utilizes extremely rare tourmaline stones. This tourmaline is mined from small Chinese villages, and through our special processes they provide a significant increase in natural negative ion content. These negative ions are very helpful in improving the body's nervous system as well as boosting metabolism. Energy emitted from tourmaline stones also improves blood circulation and fights off harmful toxins within the body. Poisons, metals, waste, and carcinogens are greatly reduced after being exposed to tourmaline. Regular exposure to tourmaline greatly improves overall health and life expectancy. This InfraMat Pro has many high-quality features and benefits. • Adjustable LED display. Great for adjusting the warmth of the healing pad to reach and maintain the exact level of comfort desired for any individual. • Far-Infrared generated by heat penetrates tissues, muscle, and bone to safely and effectively heal a wide variety of ailments and improve multiple aspects of life, including stress relief, an improved immune system, and flush out toxic elements and waste within the body. • A high amount of negative ions, which impact functionality and improve metabolism and overall physical health. The combination of the jade stones and the enriched tourmaline stones ensures that the Inframat Pro produces the absolute highest amount of negative ions of any healing mat on the market. • Very lightweight and compact. The InfraMat Pro is very easy to store and carry while traveling. Now you can enjoy the benefits of this healing mat from anywhere with ease. The benefits of using the InfraMat Pro are obvious. The stones and materials used in this healing mat have been selected after extensive research and assessing the benefits of each stone used. With the unique combination of jade and tourmaline stones used in the InfraMat Pro, improvements to overall health and quality of life are noticeable almost immediately and provide better results than any other mat on the market. Order one today and become a healthier person.